Still in full celebration mode for the return of our beloved Peter Parker, Marvel's been releasing more and more Spidey related stories all staring the original Web Head himself, Peter Parker. There's the newly launched Amazing Spider-Man with Peter, Dan Slott is also penning a mini series about Peter's first days titled Learning to Crawl, and now there's this Marvel One-Shot written by long time Marvel letterer Joe Caramagna. 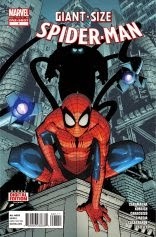 This is sort of like Learning to Crawl but its a collection of short stories about Peter learning about all his new powers and learning how to use them, all while putting a new fresh spin on the origin tale of the greatest super hero this age has known, Spider-Man. with the radioactive spider and you all know the rest. The wrestling, the death of Uncle Ben, the retribution, the power, the responsibility. The stories are split into two parts, with one artist usually doing each part. This is a real cool way of getting some names out there, I love it personally. This gets people noticed since its a Spider-Man title, you know its gonna sell and people are going to see your name. And the artist gets some satisfaction because well, they're working on a Spider-Man book! You can't go wrong! The next story is about the Vulture. Just as Spider-Man's getting used to his new powers...and his new luck, he's met with a new foe: eviction. Him and Aunt May can't keep up with the bills after Uncle Ben's death and they're not actually being kicked out of their house. Luckily, there's an extra bank account that Ben had saved away that has enough money for May to pay off some of the bills, but while her and Peter are at the bank, the Vulture comes crashing inside to rob the joint (because the plot calls for it!)! They take the fight to the skies and ends when Spider-Man uses his quick thinking to blind the Vulture and the old man slams into a nearby building. Next up is a villain everyone should be familiar with by now, Otto Octavius. Peter's starting to slowly learn about all his new powers. His strength, his agility, and especially his Spider-Sense. He's drawn to a giant spider killing machine and when J.J. won't buy any of his pictures, Ben Urich who gives Pete a quick tip that helps in the Spider-Bot story. Peter as Spider-Man heads to the location given by Ben and he learns all about Doc Ock's plans, but not in time. Octavius has found the creepy crawly intruder and the fight begins. Turns out, Ock has a bomb that's going to blow and end up destroying a lot of people's lives. Again some fast thinking gets Octavius out of the picture, but there's still a bomb laying there needing to be defused. With some MORE luck, Pete is able to pull the right plug and the bomb is handled. Whew, these last couple days have really been filled to the brim with fun hasn't it? The final story of the book is all about the Sandman. Pete's asleep in class when he gets called to the office of what I'm guessing is the guidance councilor. He starts talking to Peter about the Sandman attack the other day right in the school, and there's two different stories. One story goes that Peter ran out and Spider-Man came back in being all buddy buddy best friends with Flash Thompson (we can all guess who told that story huh?). Pete's able to recall his side of the story where he beats the Sandman with some water and electricity to make a beautiful new solid mascot for the school. In all the aftermath, everyone is safe and Peter is on better terms with Aunt May. Now that all the money is handled, things are starting to look a little brighter every day. This book was a little different than what I thought it would be. I figured it would be a big old bunch of new stories, not exactly a retelling of some old stuff, which is sort of what we're already getting with Learning to Crawl, but even that's a new story. I still had a lot of fun reading it, and like I said, its a great way to get some unknown names in the business out there and noticed. Until next week readers!